There will be no camp for 2019. There are some BIG changes this year. Please note the LOCATIONS of events and classes are NOT at the hotel. The addresses are below. There will be NO early registration on Tuesday night. Registration will be at your first class location. You will receive your registration badge, gift bag, and t-shirt if ordered. “Like” us on Facebook to get instant updates on classes and events. *Meet ‘n Greet Teachers Market and Showcase. FREE this year! * Gift Bag Exchange (see Special Events for details) Saturday brown bag lunch. *Easy Peasy Lemon Squeezy – 1 hour simple quilt projects. Friday before the PJ party! *”Quilt-til-you-wilt” Pajama and Pizza Party! 2018 Registration forms are available on the “Registration” tab above. Registration fee is $35. Classes will fill up fast, so don’t delay! Classes are filled on a first-come/first-serve basis. Online payment is available OR open and print the form, sign and send it in with payment. Classes are half-day, full-day, evening, and even one lunch-time class. Some classes have an additional supply, kit, or pattern fee that is paid directly to the teacher. Some require advance purchase and preparation of supplies. Some include EVERYTHING needed. Please let us know if you have any questions. Supply lists are in the class descriptions. Some classes have no supply list. Some supply lists will still be added. 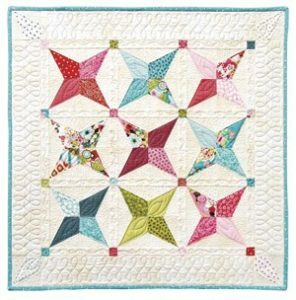 This is a great refresher course for those who want to improve their piecing. The schoolhouse block is perfect for teaching precise seam allowances, matching intersections, and easy set-in seams. Everything is already cut so just come and sew! Leave with directions for a mini quilt, a crib quilt, and a bed-sized quilt. Be a party girl! You’ll love these cute and clever pincushions. All the machine sewing has been done for you – all you have to do is some hand sewing and gathering, turning and stuffing, and embellishing. 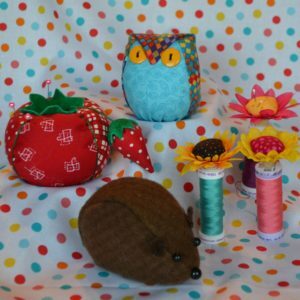 Make an owl, a wool hedgehog, a spool flower, and updated classic tomato, and more! No pattern, no sewing required. Do you struggle with what colors to pick for a pattern that you love? Does a finished project ever feel too busy, out of balance, or just boring? Then come learn the basics of color theory and learn skills that will help you choose the best colors for your next project. Value (how light or dark) and its Saturation (brightness) can make your project look spectacular or cause it to feel bland or unbalanced. 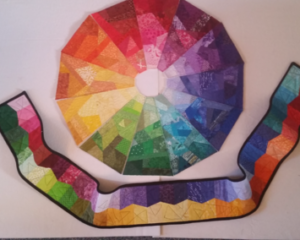 We will be using a color wheel and value scale (provided in kit), color sheets and fabric to practice/play with different color theory concepts such as value, pattern, texture, contrast, analogous, split compliment, triad and tetrads. We will discuss how the choices we make in fabric end up changing the final look of our projects. We will exchange fabric pieces during the class and you will leave with lots of pieces to make one of the color theory projects shown or create your own. Explore the art of fabric painting with acrylics–you don’t need to be artistic to create beautiful results! 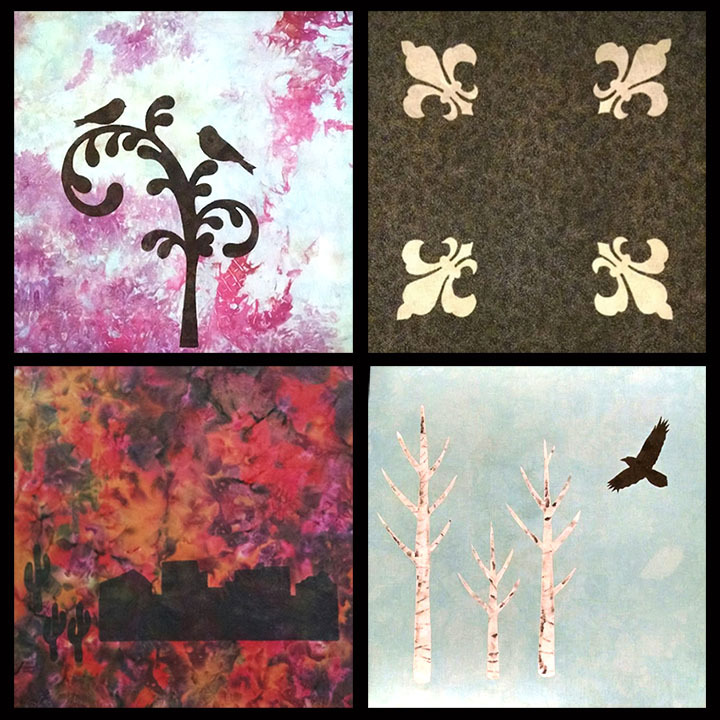 This class focuses on a masking and painting technique that enables you to plan and lay out your own unique painted designs. Learn how to prepare your fabrics, mix acrylics with a special fabric painting medium, apply, and heat-set so that your pieces will be washable and permanent. You’ll have time to learn the process and then put it into practice using some of the designs provided in class, or by making your own unique design “masks”. This fun and easy technique opens up a whole new world of possibilities for creating striking results on fabrics! Luminous stars glow against a night sky in this Touching Stars variation. This innovative strip-piecing method for the Lone Star is unlike any other. You’ll learn precision cutting, pinning, sewing, and pressing techniques and discover how easy set-in seams can be. Make one star in class for a wall quilt or let it become one of several in a larger quilt. Do you dread the process of basting large quilts for domestic machine quilting? If you’re looking for a better way, join us in this class where you will learn to easily sandwich and baste any size quilt in preparation for machine quilting. We will start with a demonstration of a spray-basting technique that will enable you to sandwich anything from wall hangings to king size quilts quickly and painlessly. The entire basting process is done on counter-height tables so there is no crawling on the floor or bending over. First, see a demonstration of the entire basting process using 505 spray, but please note that this method also works well for pin-basting and thread-basting; the choice is yours. Then learn how to make your own “basting boards” from a few simple materials, and how to set up multiple tables for really wide quilts. 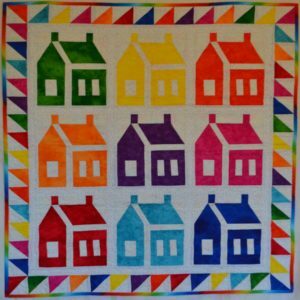 Class participants are encouraged to bring their own prepared top, batting & backing to get some hands-on experience during class, and go home ready to start quilting! four light colored fabrics, four dark colored fabrics and a center block, you’ll create a block with a variety of looks depending on layout and fabric selections. 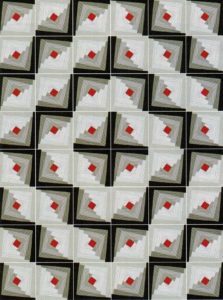 This class is designed for the beginning to intermediate quilter. Depending on your sewing experience, you may be able to finish three 12” quilt blocks in this full day class. A kit is available. #301 Sew Many Quilts! Skill building techniques. Make more and even better quilts with these great techniques for easier and more efficient cutting, pressing, and sewing. You’ll use this innovative assembly technique for all your quilts. This interesting woven design uses only whole inches on the ruler making it ideal for novices. Start a crib or lap quilt in class and leave with directions for a bed-sized quilt. 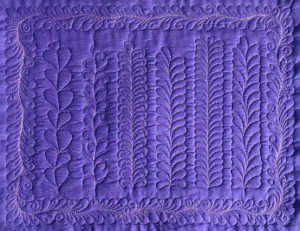 Feathers are a popular and versatile quilting design that, with a little practice, can be accomplished by anyone with basic free motion quilting skills. This class covers the “anatomy” of a feather, and explores several different feather styles including options suitable for relative beginners as well as options for more advanced quilters. Learn how to to embellish basic feathers with decorative elements to make them stand out. Learn how to use feathers as a focal point, in blocks and borders, as a background fill, or as an all-over design. You CAN quilt feathers; you just need to learn a technique that works for you! Level: Confident Beginner & Up – Quilters will find this piecing method much easier than it looks! Class Pattern fee: $10 to be paid directly to the teacher. Please see the supply list for pre-class fabric preparation. 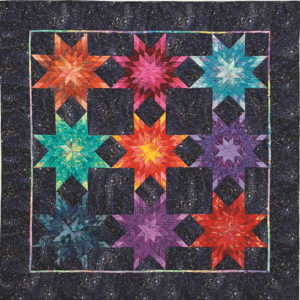 Would you like to make a complex-looking star quilt in a few easy steps? Then you’ll love this unusual “disappearing” block technique! Simple straight stitching, cutting, and rotating, and – like magic – beautiful stars will appear. This quilt is created from 10″ squares so you can cut scrappy squares from your stash, use 2 layer cakes, or cut your squares from just 2 fabrics – one light and one dark value, plus coordinating border fabrics. 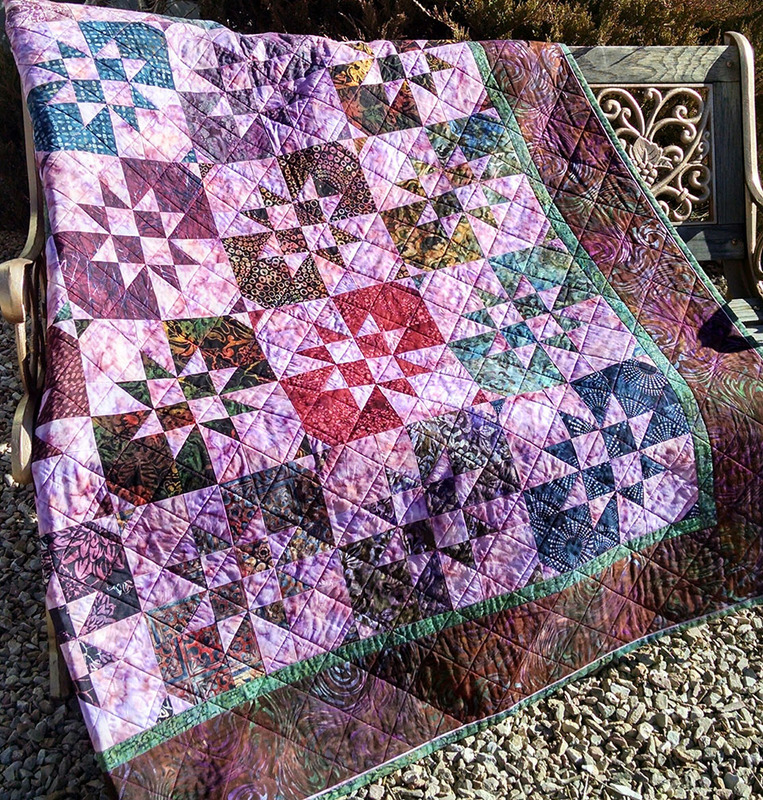 There are several fabric selection options for this quilt to give it your unique style: Totally scrappy stash-buster, Planned scrappy stash-buster, 2-fabric quilt, Layer cake precuts. Fabric Starter kit includes some fabrics to use in your blocks so there will be some continuity. Students will need to add additional fabrics to complete their blocks. The blocks will have a specific assigned size, and should be representative of your own quilt making skills. Any technique is welcome. All of the blocks are to be completed PRIOR to class. When you sign up for the class, we will send you some basic and specific instructions, and a fabric starter kit. The sooner you sign up, the sooner you can start working on your blocks. You will be making TWO blocks for EACH fellow student. There is a maximum of 24 blocks that will need to be completed prior to class as “homework”. We will exchange blocks at lunch on Friday and will receive the rest of the directions. Of course, you can finish it in any way you’d like. See how much you can get done at the PJ/Pizza Party/Open Sewing Friday night! $10 . If you want a kit (for a small additional fee), see the supply list and contact us to get in touch with Ruth. ***Bring a friend, child, parent, sibling. NO registration fee required for this class! Achieve smooth bindings with perfect corners and learn a great method for joining the ends. Get great tips on preparing your quilt for binding. Make a sample of a traditional binding, then practice angled and scalloped edges. Try new “gourmet” bindings such as two-color and faux piping. 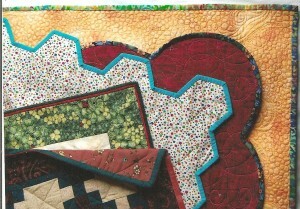 You’ll bind small quilted samples with all fabrics and bindings included in the kit. Skill Level: Intermediate. Some previous free motion quilting experience is needed; you should be confident in setting up your machine for both free motion and walking foot quilting, and be comfortable enough with both so that you can focus on building your design repertoire. Learn to create both free motion and walking foot background designs with your domestic machine. 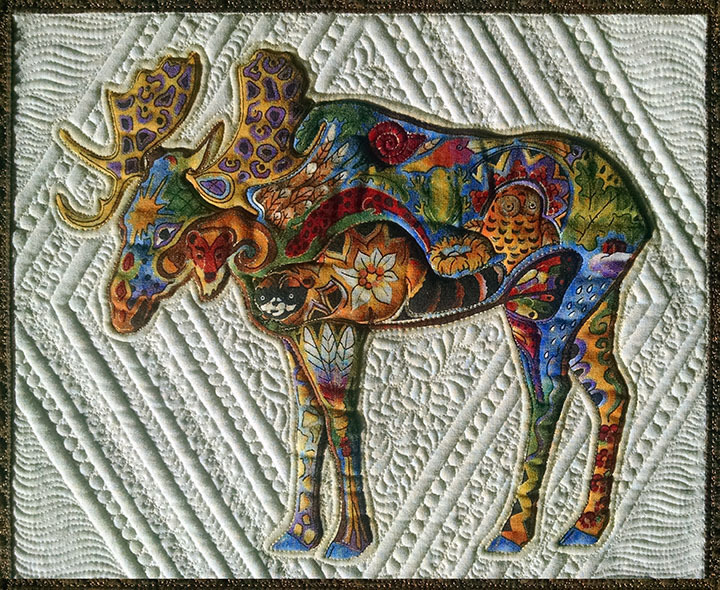 Add texture, depth and movement to make your pieced blocks, applique and quilting motifs really stand out! 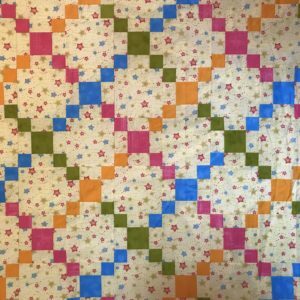 In this hands-on class, you’ll learn how to create a variety of background designs to use in the negative spaces of your quilts to accentuate larger focus features. Spend the morning developing and practicing various background designs with your walking foot and with your free motion foot on sample quilt sandwiches that you can keep as your personal “reference library” of designs. In the afternoon you will put your new skills to use by background quilting a prepared panel available directly from the instructor in class. Let’s make a 36” x 36” quilt. A fun quilt for summer. Nine blocks and a bit of sashing makes a sweet quilt for baby or a table topper. You can finish this quilt in time for the fair! 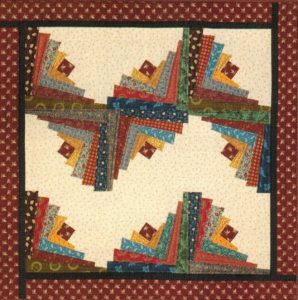 Depending on your sewing experience, you may be able to finish the quilt top in this full day class.A kit is available .